Analogue weather station with barometer, thermometer, hygrometer function. On the basis of the measurement range the weather station is only useable for indoors. The Sputnik is one of the most exotic analogue weather stations available on the market. 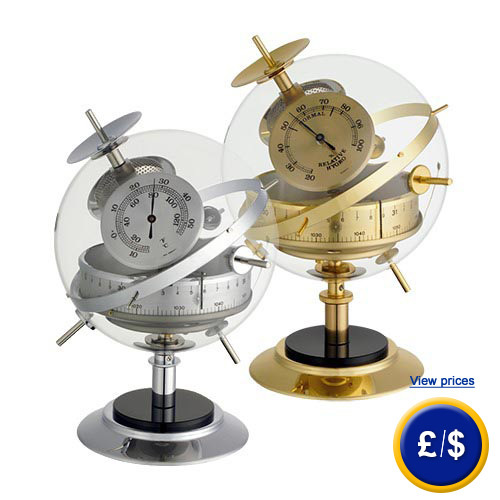 A transparent plexiglass sphere fixed on a stand shows 3 high-quality measuring instruments, barometer, hygrometer and thermometer. The view on the complicated measuring instruments is thereby left free. A highly interesting device for weather monitoring and an eye catcher. If there are any questions about these products, please call: UK customers +44(0) 23 809 870 30 / US customers +1-410-387-7703. An overview of all weather stations can be found here: weather stations. Our technicians and engineers will gladly give you advice on this thermo hygrometer and all other products in the field of measuring instruments, regulation and control and scales.